Discover the very first video game that comes with an exercise bike-have fun while pedaling! Cyberbike, known as Cyberbike Cycling Sports in Europe, introduces a brand new way to do sports in your living room. The game invites you use your eco-citizen's head and legs to clean up the planet. Clear paths and roads of the sources of pollution that are ruining the environment as you cycle along on some of the most improbable vehicles ever imagined-on land, sea and air. Using the bike included with the game, players are able to ride through 18 different circuits. As you progress, numerous accessories are unlocked to customize your vehicles and equipment, such as new backpacks and new vehicle colors. 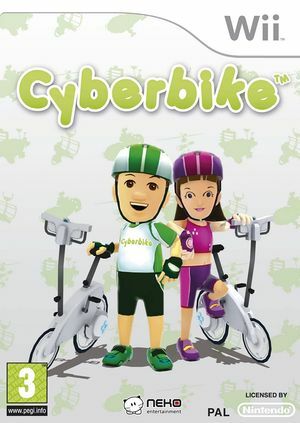 Cyberbike is capable of using both GameCube controllers and Wii Remotes. If a physical controller is set to emulate both a GameCube Controller and a Wii Remote concurrently, it will operate both devices at the same time. To fix, migrate controls to use separate physical controllers. The graph below charts the compatibility with Cyberbike since Dolphin's 2.0 release, listing revisions only where a compatibility change occurred. This page was last edited on 3 March 2018, at 07:37.